Welcome to the second Bainton Fisheries Newsletter, which is designed to keep you informed about the Fishery, in terms of news during the last season and some up and coming events and issues. Membership has grown very well from the 2000-2001 figure of 60 fishing members. There are now 103 fishing members and I am pleased to announce that an operating profit of some £2500 has been achieved. Whether this level of membership can be sustained or demand will further increase in 2002-2003 is really an unknown quantity. I suspect Baston Fen being closed locally may have been an influencing factor combined with good things spreading along the angling grapevine about Bainton. In last years newsletter I expressed a view that 100 members would be an ideal limit to assess whether to cap future membership. Although I get no great sense that the fishery is pressurised I was keen to explore the possibility on setting an upper limit for the 2002-2003 season during the April 2002 members meeting (see later). In 2000-2001 two stockings were managed. This season due to greater affluence in club funds we managed a total of 6 stockings. This upward trend is something I am keen to maintain, the problem is finding suitable sources of fish at a reasonable price. The approach I prefer is to borrow netting equipment from the Environment Agency and net fish for ourselves paying the owner for the fish direct, rather than pay expensive commercial rates from fish dealers where the source of the fish is often unknown and their disease and stress status can be questionable. If members know of lake owners who would be interested in selling fish to Bainton Fisheries then please pass their details to me. 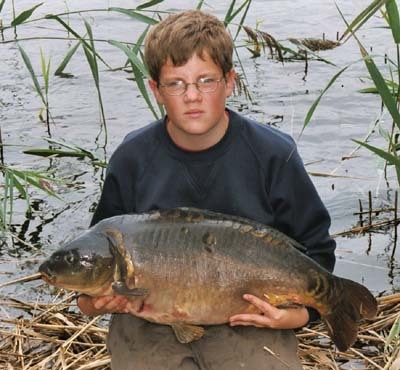 April 2002 – 6 carp to 13½ lbs split between the big and new pit. Total expenditure on stock for 2001-2 came to just over £2000. Three working parties were held in 2001 and I believe that about 30 people from a total membership of 60 managed to attend at least one. Work concentrated on creating more swims on the carp lake, L shape and a general tidying up session on the Orchid and Match Lake. The developments that I am keen to pursue in the coming year include more swims on the Orchid and Match pit. Creating platforms could do this. The downside to this is that the materials are quite expensive, working out at approximately £130 for scaffolding and timber per platform. The advantages are that a platform can be erected in a few hours and using quality materials will last for many years. Of course they are not to everybody’s taste but can provide a fishing spot where no other option will allow access to the water safely. Other developments that I have initiated this year is to introduce 50 native water lilies into the new pit and carp pit to provide cover for fish and to add to the aesthetic attraction of the lakes. This is very much an experiment and if successful I may be tempted to do the same in the shallow parts of other lakes. I am getting a little concerned about the pike weights and the direct relationship with the reduced abundance of rudd in the L shape and Orchid pits. Having consulted widely I have come to the conclusion that I need to create more fertile conditions for smaller fish species and have decided to take a leaf from fish breeders books who “hot-house” stew ponds to create massive fry hatches. This spring I will artificially fertilise the Orchid pit with phosphate to attempt to create a pea green algal bloom in late spring. This will in turn trigger a bloom in small water creatures such as Daphnia. These blooms will hopefully create a bumper crop of food for rudd and tench fry to feed on in the early summer. Hopefully fry survival will be high supplying more fish for anglers and predators alike to catch in future years. I would be keen to hear member’s observations about this experiment during this year so that I can form a view as to whether to repeat this on other lakes. It is believed that a treatment will last two years without need for a repeat. “Hot-housing” a lake could be a cheaper alternative to repeated stocking, it will reduce light which will slow weed growth and may restrict the hunting by cormorants. Sunday 28th April from 9am – Match Pit, chest waders, cordless drills with screwdriver attachments and plug socket spanners especially needed to erect platforms. Also wheelbarrows and spades would be useful. Sunday 12th May from 9am – Orchid Pit, general swim creation and gardening to encourage anglers to fish the Maxey Cut bank, improve vehicle access. Big Pit – Two new swims and general gardening, Removal of stile. – New Pit – removal of stile and various unsightly structures. Sunday 26th May from 9am – L Shape – Improving two swims with steps and gardening. – Carp Pit – Minor gardening and road maintenance. It is a condition of membership that everyone attends one working party. Clearly I do not expect disabled or elderly members to attend and some people have to work at weekends also. But every able bodied member can help out in some way even outside of an organised working party. In terms of arranging a plan of action for the working party days I would be grateful if members could either e-mail or ring me before hand to say they are coming. This will enable me to plan the tasks ahead for the day. Items that are particularly valued for working parties are chest waders, bow saws, loppers, spades, pickaxes and if people have access to 4x4s, trailers or even a JCB it can make light work for all. A huge sense of humour is also mandatory. I am also sure that there will be opportunities for netting parties during 2002 to transfer fish into Bainton. These are usually within an hour’s driving radius of Bainton and are extremely hard work, but rewarding nether the less. Chest waders and a strong back are essential, also cars with tow bars or trailers are very helpful. No dates as yet have been set but if you would like to register for a netting party then please let me know. It was agreed to withdraw the pike fishing permit on the Carp syndicate pit, as it had not proved to be successful. There is a waiting list of 20 anglers to join this lake and there are currently 20 members. Members agreed to increase the membership to 25 from June 16th 2002 as fishing pressure is still relatively light and increased angling pressure and bait had been shown to get the carp responding all year to angler’s bait. The waiting list was also discussed as some members felt that paid up anglers playing an active role in supporting the fishery that were on the syndicate waiting list should take precedence over those who were not members. After a lot of debate a vote was taken and by a significant majority it was agreed to support this proposal from the floor. Members were reminded to stick to the track around the lake so as not to antagonise the local farmer. Site Access. Site security was discussed and members were reminded of their obligations to ensure that unwanted elements were ejected from the site. It was agreed that LeFage’s site manager’s tel no would also be published in the Permit. Some gaps in the barbed wire fence along the West Deeping Road were also offered to be fixed. A discussion was held on what Bainton Fisheries exact rights were to deter non-members from accessing the site and the correct route for the Public Footpath across the site. Further work is needed to investigate this and a few members and myself took several actions away. Dog walkers specifically were discussed. It was accepted that the vast majority were responsible and their dogs kept under control and well behaved. However some were irresponsible and showed no respect for anglers or wildlife. Incidents and confrontations had occurred with owners and dogs threatening members. It was pointed out that serious matters such as these should probably be reported to the police. Dogs fouling the site was also discussed as some owners are not making any effort to avoid anglers swims and either take their dog’s waste home with them or move it into the undergrowth (unbagged). I am sure that Bainton members that are dog walkers understand that they have a responsibility to anglers. What I need to ensure is that non members who access the site understand that there are certain rules and courtesies that need to be observed. Some new signage will therefore go up. Despite the NO PARKING signs outside the main gate, people are still blocking the gate. A meeting with LeFarge will seek to identify if more restrictive measures can be introduced. LeFarge will also be encouraged to repair the potholes in the main road through the site. It was agreed that a system of planning permission would be introduced for creating swims and that any future creations would have to seek approval from myself first. The following was agreed to be this years stocking policy: – To develop a 3rd Carp lake within the complex, this will involve moving carp between 3lb and 10lb from the Carp lake to the Big Pit. Syndicate members are asked to play an active part in this and ensure that they have carp sacks and heavy plastic bags to facilitate the movement of fish. EA approval will be sought to block move 100 carp over the summer and anglers are asked to record and report movements to myself. Future netting will also be targeted at obtaining carp for the big pit. Contrary to last years meeting, it was decided to leave the carp in the new pit. Other species that I will also try to obtain this year will be some more bream and crucian carp. There is also a possibility of some grass carp to be stocked into the Orchid Pit. On the 18th November, 23 Pike anglers took part in a charity event at Bainton fisheries to raise money for the 2nd Chance Children’s Angling Charity. The weather in the week prior had been rather cool and the water temperature was low. On the day the air temperature had raised to about 10 degrees C but the water was still cool. Top weight for the day’s event was 12lb 6oz to Alan Smith, closely followed by fish of 12lb to Chris Bishop (runner up again). The good news was that £240 pounds was raised for charity and that a good social day out was had by all. About a dozen pike were caught during the day. A big thank-you for all your support in my second year. We are a few steps further on a long journey and already I hope you are seeing some improvements. 20lb 6oz to one of our youngest members from a pit with more acres than carp?